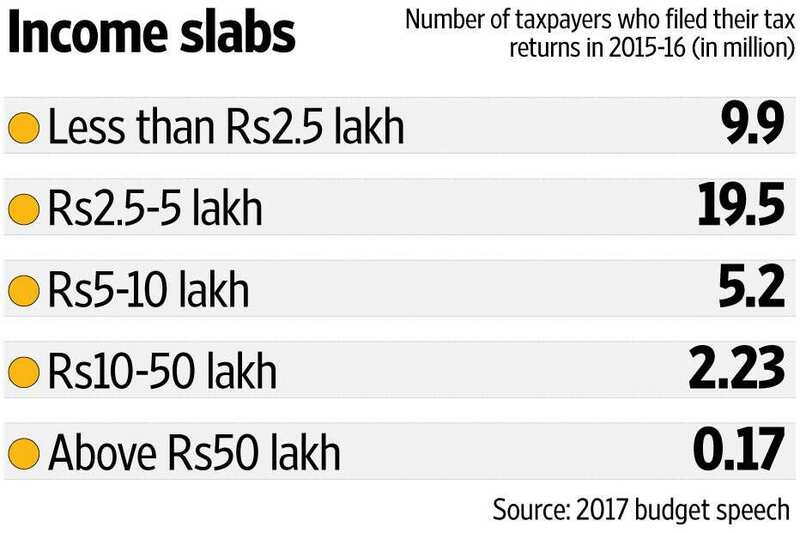 The budget proposals announced by finance minister Arun Jaitley focused on rewarding honest taxpayers, taxing the rich and bringing to task economic offenders. The budget for 2017-18 announced tax sops for the middle class and small companies while increasing the tax liability of the super rich. It also sought to bring to task people like UB Group chairman Vijay Mallya, who has fled the country while cases are pending against him in various courts. Jaitley proposed to reduce the tax rate for individuals in the income tax slab of Rs2.5 lakh to Rs5 lakh from 10% to 5%, giving some relief to the middle class. He also proposed a simple tax return form for this category of taxpayers. The finance minister also sought to reduce tax rates for small and medium-sized companies as part of an earlier promise to gradually reduce corporate tax rates and phase out exemptions given to companies. The tax rate for companies with an annual turnover of up to Rs50 crore has been brought down to 25% from 30%. This will benefit 96% of the 6.94 lakh companies filing tax returns, Jaitley said. However, there was no respite for big corporations as the tax rates for them remained unchanged with the government seeking to correct an anomaly wherein companies making a profit of less than Rs1 crore pay tax at an effective rate of 30.26% while those making a profit above Rs500 crore pay tax at an effective rate of 25.9%. The finance minister announced a surcharge of 10% on individuals earning between ₹ 0 lakh and ₹ 1 crore while retaining the surcharge on those earning above ₹ crore at 15%. Jaitley also proposed to bring in a law to confiscate properties of economic offenders who have fled the country. “In the recent past, there have been instances of big-time offenders, including economic offenders, fleeing the country to escape the reach of law. We have to ensure that the law is allowed to take its own course. Government is, therefore, considering introduction of legislative changes, or even a new law, to confiscate the assets of such persons located within the country, till they submit to the jurisdiction of the appropriate legal forum. Needless to say that all necessary constitutional safeguards will be followed in such cases," Jaitley said. These measures are a reiteration of the National Democratic Alliance’s intent to focus on the poor and marginalized. The provision of benefits to farmers, the poor, and salaried middle class while taxing the rich is also aimed at dispelling the tag of “suit-boot ki sarkar" given by the opposition. “That (super rich) segment will not turn away from the Bharatiya Janata Party just because of this. They may not be hurt by this increased tax and this will not affect them as much. The finance minister in his speech made sure that a clear message was sent that the government is getting tough with economic offenders," said Sandeep Shastri, a Bengaluru-based political scientist and pro-vice-chancellor of Jain University.